ALL OTHER TINY RECORDERS READY FOR THE INVESTIGATIVE MUSEUM! LAW ENFORCEMNENT GRADE AND 300 HOURS RECORDING TIME! • Nano Technology At It's Very Best Has Arrived for High Grade Long Play Audio Digital Recorders. 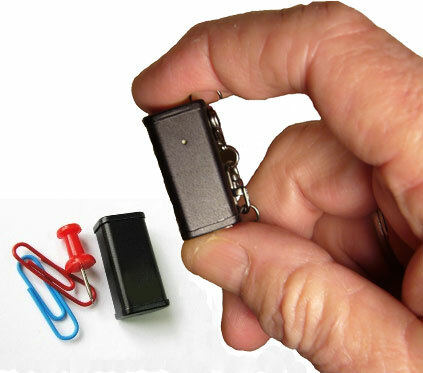 • World's Smallest Digital Audio Recorder Look At The Photo To Left! It Is smaller Than a standard sized paper clip! Just a little bigger than a push pin! • So Small, It Is Manufactured Under A Microscope And When You Hold It In Your Hand, You'll Want To Look At It Under A Magnifying Glass. 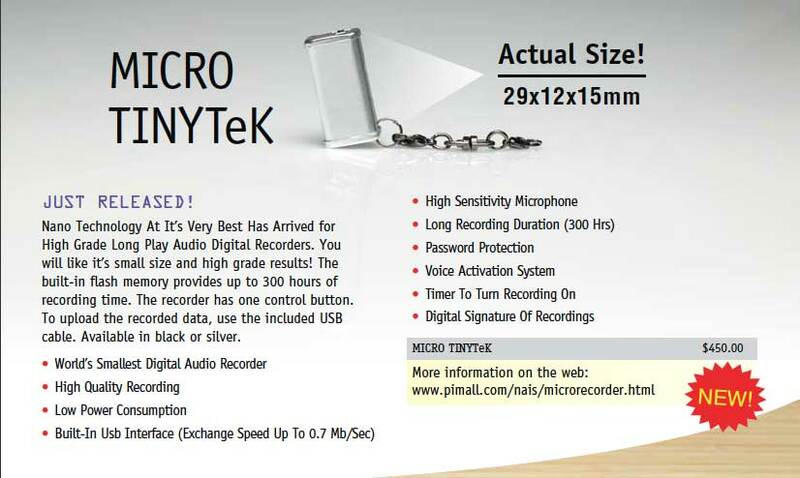 AMAZING MICRO TINYTeK 300 HOUR DIGITAL RECORDER! This tiny recorder is incredibly small. In fact, it's the smallest recorder ever made! Law enforcement grade! It's so incredibly small, you will have to take time to wonder and stair at it when you get it and you might want to use a magnifying glass! This digital recorder is so tiny, it has to be manufactured under a microscope. You can completely palm this and wrap your hand around it. So small, you can place it almost anywhere! Amazing 300 hours recording time. Simple one button command! Push to record, push to stop! Works off of tiny long-lasting watch batteries (included) Comes with software and USB connection cable. If you want the world's smallest high grade broadcast quality digital audio recorder, this is it! This recorder is 12% smaller than its predecessor, which was the Guinness Book of Records winner! Being extremely miniature, the recorder supports all the technical characteristics of the TinyTeK audio recorder law enforcement grade series. The recorder's built-in rechargeable battery provides autonomic work during 25 hours (sampling rate -8 k Hz, 18 K bits/sec). Convenient design allows to use the recorder as a key trinket or tiny key chain so as not to lose your miniature gadget in your pocket. Try it you will like it's small size and high grade results! It's a world champion with high recording quality, a connector for an external microphone, and a built-in flash memory that provides up to 150 hours or 300 hours of recording. Available in black. The recorder has one control button. To upload the recorded data, use a shipped USB cable. Take A Look At These Amazing Features! • Power supply: Li-Pol rechargeable battery 75 mAh. 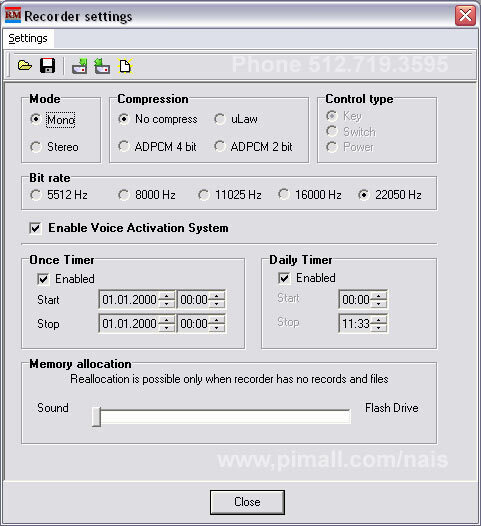 Note The Easy Settings For Mode, Compression, Bit Rate, Voice Activation And Timer! 20, and 50 Call For Dealer Pricing!